My practice involves an engagement and meditations with the landscape, making visible the invisible by creating a tangible response to forces that are not immediately apparent. Utilising intuitive methodologies, I unravel shared experience through water. My process involves serial dilutions, where each iceberg sample is explored to see what is held within. Substances which have been submerged or diluted in water, leave a trail or impression. There are varied resonances which were locked inside icebergs; that which was frozen for a time is now being released. The essences based on processes of serial dilution form tiny poetic time machines where each ice sample is explored to see what was held within it. The iceberg remedies initial intention was for the land and other water bodies. The contradiction of a essence made from water and diluted with itself presents interesting questions around the uses and permutations of a landscape whose energy-fields mediate and co-exist with the human body. contemporary environment we find ourselves in. We are living in world where we only see the tip of the iceberg, big energy in little spaces. Somehow there is a vivid burst of brilliance, like fireworks, a healing light in a hazy apparition. I also worked with Masaru Emoto, who is best known for his ideas that human consciousness has an effect on the molecular structure of water. 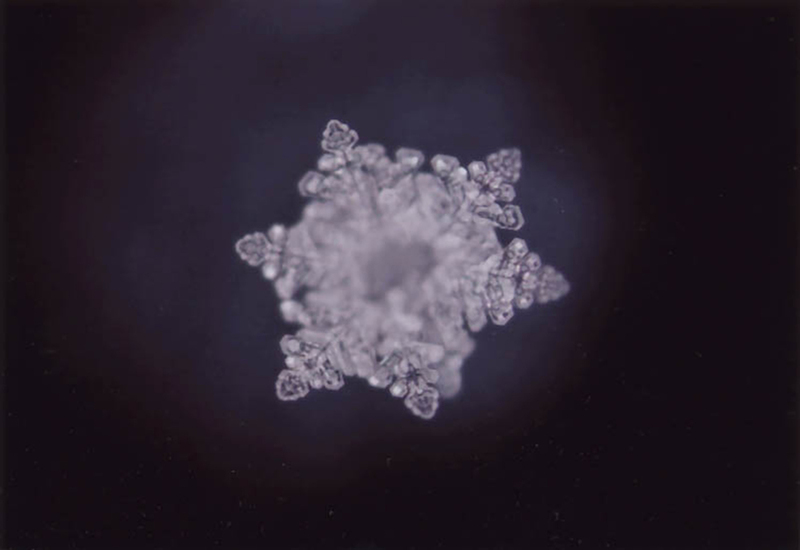 Emoto’s hypothesis has evolved over the years of his research working with frozen water crystals. He believes that water takes on the resonance of the energy, which is directed at it, and that polluted water can be restored through prayer and positive visualization. He shows this through changes in the crystals exposed to different words and sounds. He grew a crystal for me from the meltwaters of an iceberg I collected in the Arctic in 2012.